In the morning Brandon and I travel back to the legendary village of Chambolle Musigny. We now understand why this is such an exceptional commune and are excited to visit. Laurent Roumier’s father, Jean Marie, is the brother of the legendary George Roumier. This is a small Domaine, completely cult and always sold out. Fixin is one of the Northern communes of the Cotes de Nuits. It is small and sometimes forgotten, but not after this class. Emmanuelle explains how the mother’s side and father’s side of their family combined their assets across Cotes de Nuits to create Berthaut Gerbet. Like Alex Millot, she is young, intelligent, respectful and determined – in other words bound to succeed. 2ha. 1 year barrel, no new oak. Blend of 3 vineyards, 1 year in barrel, no new oak. Just above Richebourg, very steep. Frédéric is the father and Michel is the son. Michel is running the Domaine now. Organic, bio-dynamic and innovative. 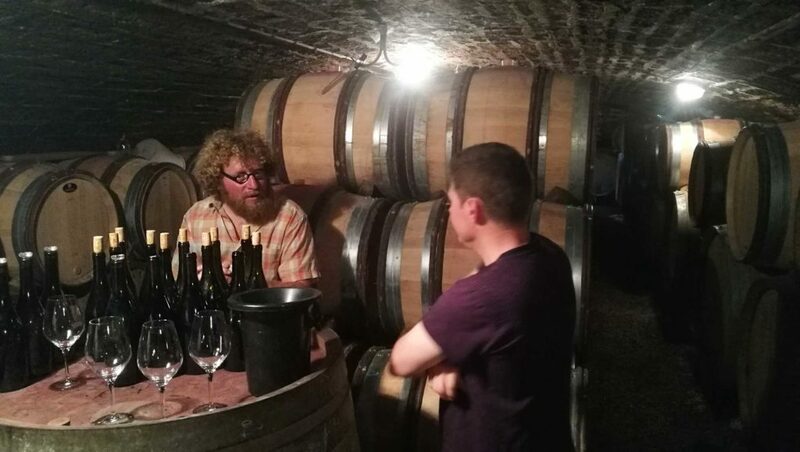 We felt like we were visiting old friends as we have been working with these guys for a few years now – I love their Clos de Beze and Clos de la Roche. We walk through the cellar and are amazed to see 100’s of terracotta amphora jars about 100 litres each. 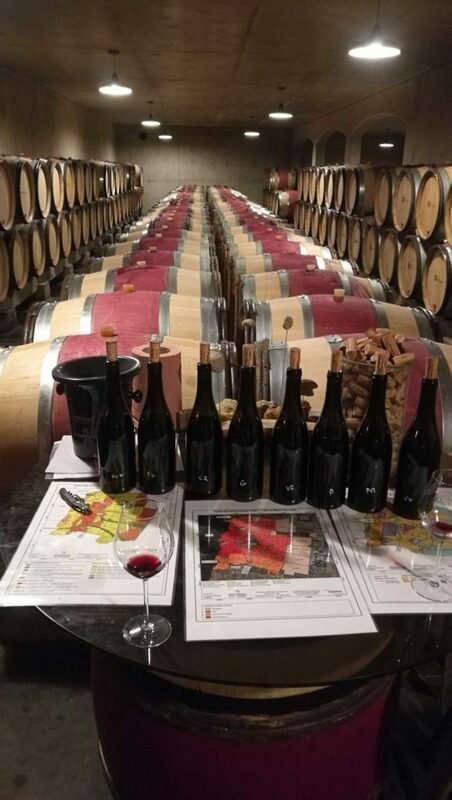 As Michel moves further and further to trying to let the terroir speak out in their wines, he is moving away from oak influence and using the more inert jars to age his wines. Bottom vineyard near the restaurant Tres Girard. Deeper soils. What an experience. Sylvain has an electrifying mob of blonde hair, horn rimmed spectacles and as much energy and vibrancy as his wines, He lives and breathes the village he was born in and lives in, Marsannay, and is seen by many as the outstanding viticulturist and vigneron of his generation in Burgundy. Amongst all this, such is his demand that he also consults for many top estates across the Cotes D’Or. On his road is his father’s cellar and grandfather’s cellar, along with his own cellar. We walk down into a small, damp room filled with barrels and barely any room to move around. The front of the cellar is his office – one huge barrel length ways with a multitude of clean skin bottles. He closes the door. “No phones, no time – I love it here” Sylvain smiles. 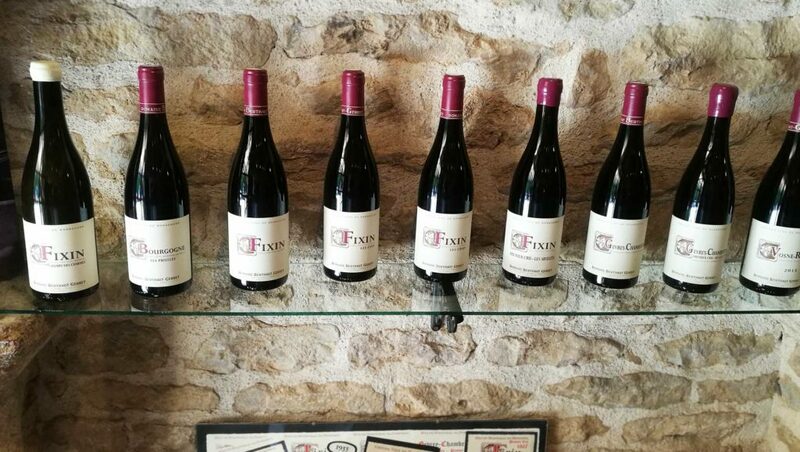 He begins with his love Aligote – “the forgotten grape of Burgundy”. Many years ago top sites across Burgundy were planted with Aligote. He notes tasting the 1964 Bonneau du Martray Aligote “exquisite” – this is no longer the case. He still has Premier Cru sites across Marsannay dating back 100 years. Over the early evening we taste 30 or 40 barrel samples. I remember every single one although I stopped taking notes as I was absorbed in the whole experience. Aligote is a small berry – bitter and fresh. It needs oxygen and oak (not stainless). It offers an aromatic nose and a bitter sweet full and fresh palate. We run through every Aligote sample, and then Chardonnay and then his magnificent and vibrant Pinot Noir. This is a man that everyone should know of and listen to. He is playful, happy, extremely intelligent and immersed in his passion.